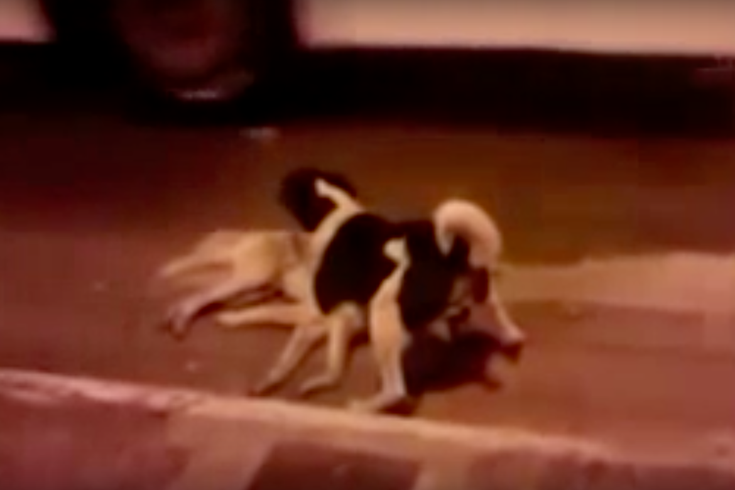 One dog protects another dog after it was struck by a vehicle on a street in Dublin, Ireland. I’m not the type of person who posts a lot of dog/cat/puppy/kitten videos online. While they may be totes adorbs to many, it’s just not my thing. But a strange thing happened last week. On Wednesday, I was a guest on WHYY-FM’s “Radio Times” program, where I spoke about “the perils of being a pedestrian in Philadelphia.” If you're interested in that kind of thing, you can check it out here. On Thursday, a video was shared on my Facebook page. Translated from Italian, the description read, “His friend was hit, and he protects him, a gesture that deserves a lot of sharing.” It wasn't directly related to the "Radio Times" appearance, but as a hit-and-run advocate, I see a lot of like-themed content sent my way. But this? This I hadn't seen before. In the video, which I’ve posted below, a dog sees that another dog has been struck by a vehicle and heads out near oncoming traffic to protect the badly-injured or already-deceased pooch. It is a remarkable sight to behold. A quick search established that this isn’t a new video; rather, it is believed to have been filmed in Dublin, Ireland, in late 2014. But the emotions behind it, both for dog and viewer, are timeless. In fact, it's so profoundly – and simultaneously – heart-breaking and inspirational, that I’d be remiss in my duties not to pass it on.